Sunday morning is a lovely time to be in Khiva. The old town - Ichan Qala - within the baked brick walls, is bustling with families, teenagers on school excursions and wedding parties traipsing around important sites. Once notorious for the largest slave market in Central Asia, Khiva's bazaar today lies just outside the east gate. 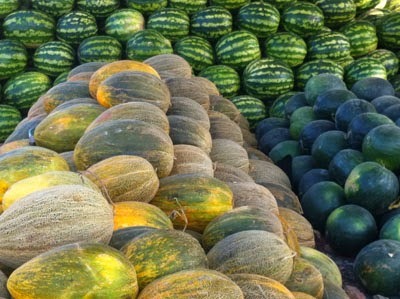 Enticing fresh fruit and vegetables are piled high or sold from the back of farmers' trucks. Men and women, their cotton blankets spread on the ground, ensure their goods are neatly arranged to display home-grown produce. 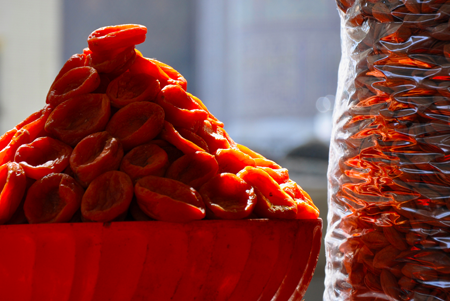 Dried fruit and nuts are arranged in pyramids and sellers are happy for you to taste before buying. Confectionery, biscuits, baked goodies, fresh meat and fish are all for sale along with clothing, underwear and socks. The market is also the place to have your umbrella fixed and your shoes repaired. You can purchase a sunduk (trousseau box for brides), a baby's cradle or a padlock - indeed anything you need for the home. Sunday is the biggest market day: it is a sprawling, marvellous affair. There is also the Sunday livestock market, held about 2 kilometres from the old town. 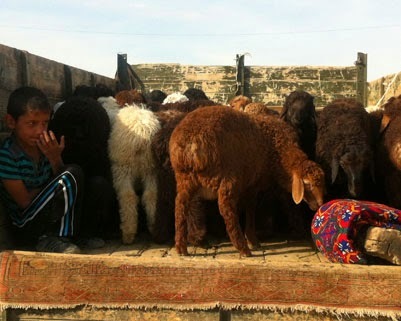 Farmers come from all over the region to sell their sheep, goats, cows and donkeys. It starts around 6:00 a.m. and is all over by 8:30 a.m.
Of course there are stalls selling practical, livestock goods such as ropes to walk your animals back home. Three small sheep will set you back around $275. There is a small kitchen offering green tea, plov and soup. This market is a great place to people watch - farmers quietly examine the livestock, negotiate prices and chit chat with their friends. Happily, on an Uzbek Journeys tour, you have a free Sunday morning in Khiva before heading out to Ayaz-Qala yurt camp. The bazaar is easily reached by foot and, for those interested in the livestock market, our driver can take you there.